These are my first impressions of this scope. I'll update the information here as I get more experience with it. Mine is branded 'Bintel' but it's the same scope manufactured by GSO and sold under different names around the world - the most common being AT12IN. The mirror is approximately 37mm thick and was already center spotted reasonably accurately. The primary mirror has a 9 point cell, and on each triangle, only one corner is attached to the mirror with adhesive tape. The other two corners are free to move. 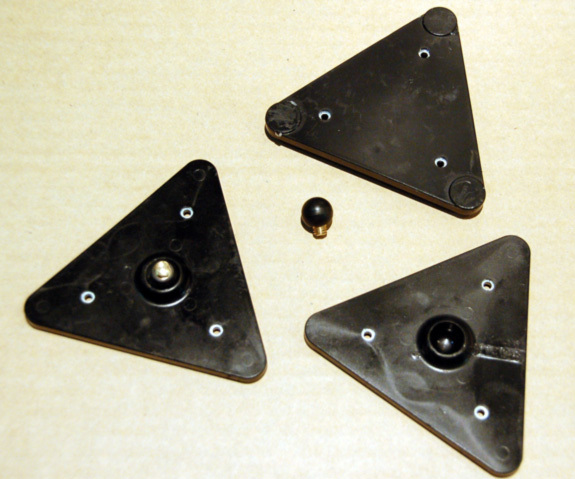 Each triangle is made of metal reinforced plastic and has a plastic socket molded on the back. This socket snaps onto a ball which is attached to the cell by a captive thread. 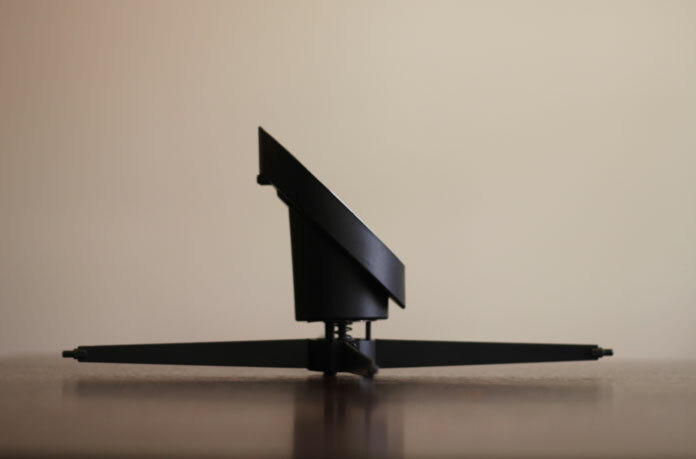 This arrangement allows the triangle to tilt and evenly distribute the weight of the mirror, but I suspect it is also a significant source of focus shift. There are 3 standard GSO style rubber mirror clips. These should be checked to make sure they are not touching the mirror (I have removed them in the image below). The cell has 3 push and 3 pull screws, and just like the AT8IN, they are spaced evenly 60 degrees apart. To me this seems a bad design - the cell can easily be bent by tightening the push screws. 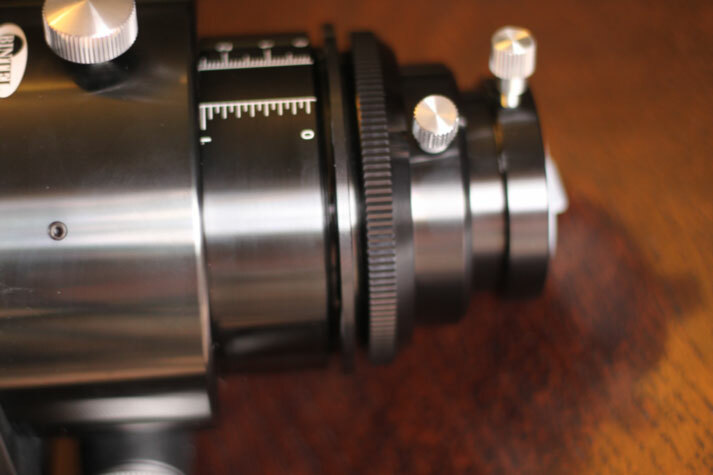 It won't effect the optical performance, it just make the collimation action more 'spongy' and less precise. 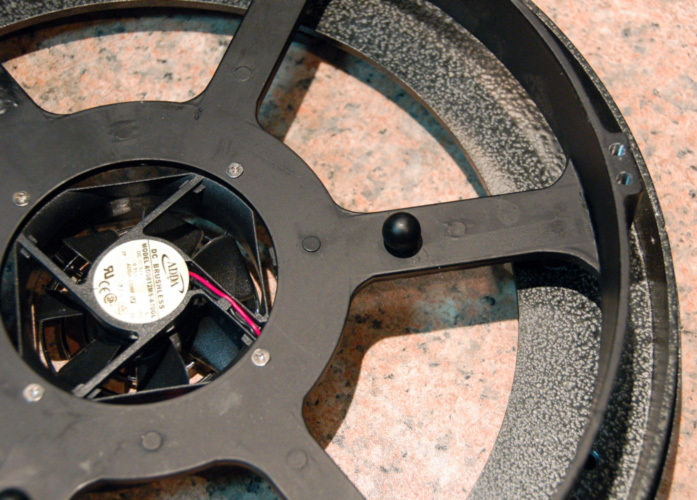 Finally there is a small 12V fan which blows cool air onto the mirror. Using this calculator the required diagonal offset is approx 5.56mm which is within the error margin of the measured value. The mirror is undersized, and doesn't even provide 100% illumination at the center of the image. Whilst this is not a big problem, I have replaced my secondary with a larger one (4 inch). 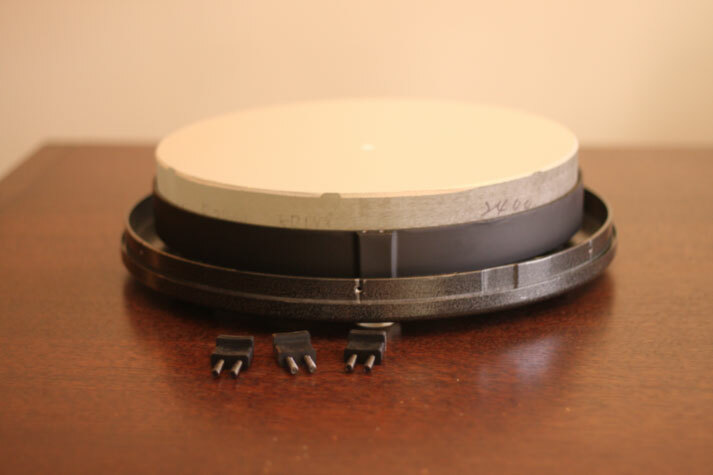 The OTA is constructed of 0.74 mm thick sheet steel, is 1150mm long and 357mm in diameter. The outside is powder coated white and the inside is a matt black paint. Reflections can be seen when looking down the OTA - so perhaps some type of flocking would be beneficial. At night the top of the OTA is usually about 2 degrees cooler then the underside. It might be a good idea to wrap the OTA in a thermal blanket to keep the temperature even. Just like the AT8IN, the OTA does flex around the base of the focuser, so I have reinforced it with a bar of Aluminium. The following video was made AFTER the OTA was reinforced with a bar of 3mm Aluminium. It's not perfect, but it's a significant improvement. By hanging the camera off the focuser, and simultaneously looking through a Catseye Infinity XLK, the shift in collimation can be clearly seen by observing movement of the center spot reflections. This is a highly sensitive test and can be used to check if the focuser or tube is sagging. In this case, it's the OTA that is bending. This is the worst case scenario - when the OTA is pointed at Zenith (where I do most of my imaging) this is hardly any movement. Just to be 100% clear - the problem here is with the OTA, not the focuser. The camera is 2.3 kg. Update: I have since replaced the OTA with a carbon fibre tube. The focuser is based on a Linear bearing, this time it's a CPC MR7W (see image below). The linear bearing works well, but unfortunately it's attached to the outside of the focuser with 4 small screws spaced very close together and the surface it's attached to is curved. The result is the entire linear bearing and inner tube of the focuser has some movement in it when only a small force is applied. Tightening the 4 screws is not a solution : it causes a the linear bearing to bind. In the image above you can see the tension knob on the bottom of the focuser. It's aluminium and threads into a captive brass nut set in to a black plastic housing. There are two serious problems with this arrangement: the tension screw works it's way loose every night, without fail. A small drop of loctite is needed. The second problem is that a lot of tension is required to hold the focuser in place. The plastic housing is not up to this job and will crack when the correct amount of tension is applied. 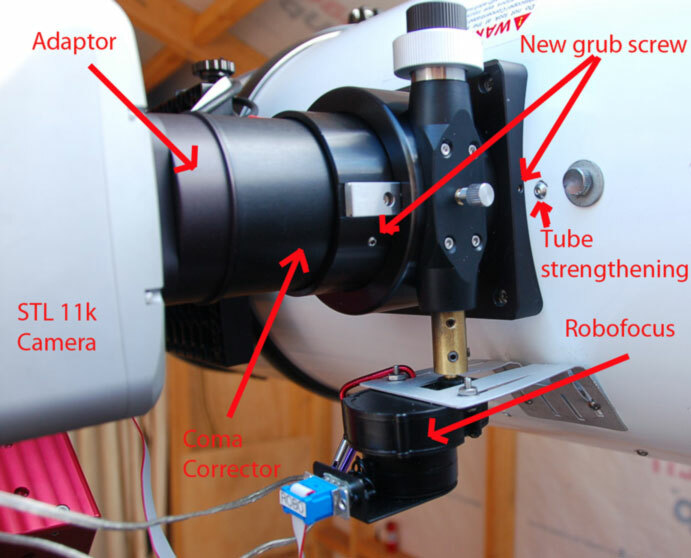 When the plastic cracks, the focuser is unusable. It really should be aluminium. 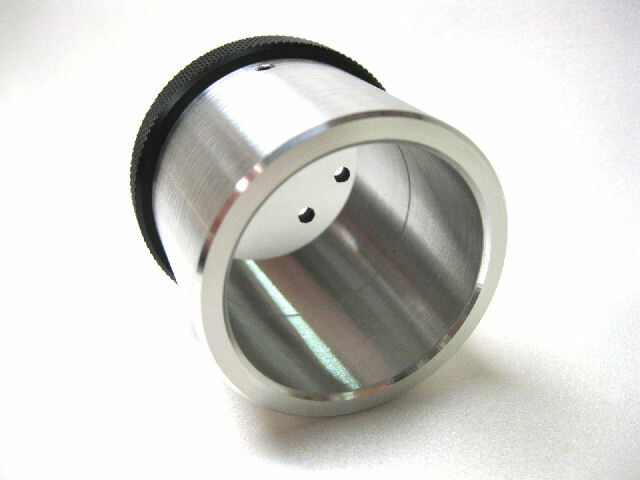 The focuser is supplied with a standard 2 inch to 1.25 inch adaptor. The 2 inch compression ring can be unscrewed (it has a 0.8M thread). This leaves another adaptor on the focuser that can also be unscrewed revealing a ID 3.002 inch M0.8 threaded unobstructed barrel. This is great news for anyone (like me) who plans to use a 3 inch coma corrector. 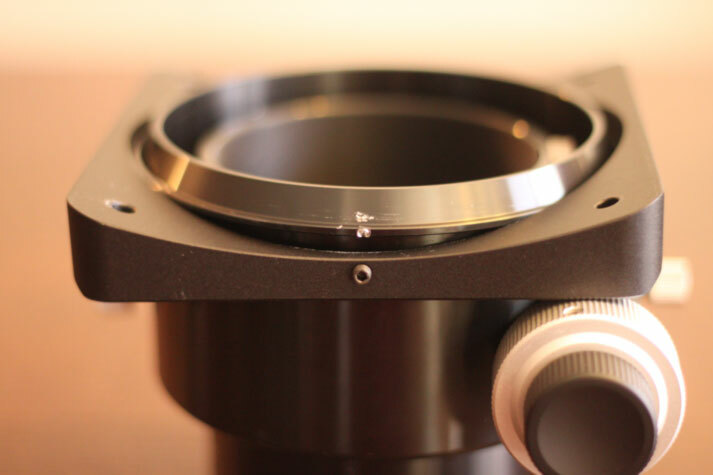 Be careful when this last adaptor ring is removed (as in the image above) - there is nothing else to stop the inner tube of the focuser falling all the way back into the OTA, separating the two halves of the linear bearing and exposing all the tiny ball bearings. Getting them back in is not easy. In the image below, I have loosened all these parts so you can see the connections. The focuser has 50mm of travel, but the last 20mm result in the focuser protruding into the OTA tube. At what point it starts to create diffraction interference I don't know yet. 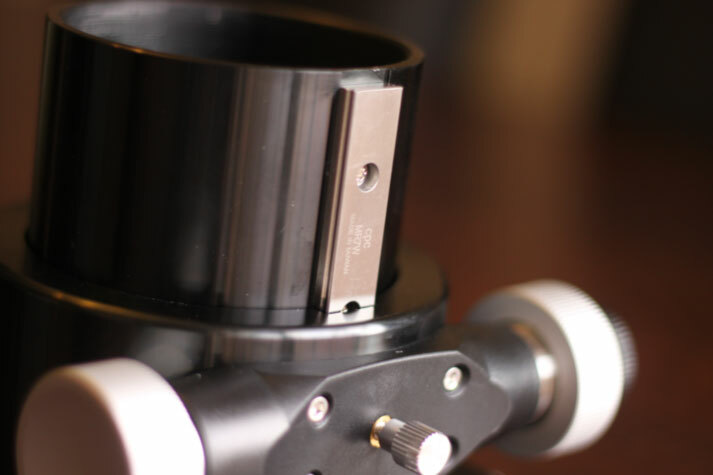 The focuser is held on the mounting plate by 2 small grub screws in the standard way, however loosening these only allows the focuser to be rotated, not removed. 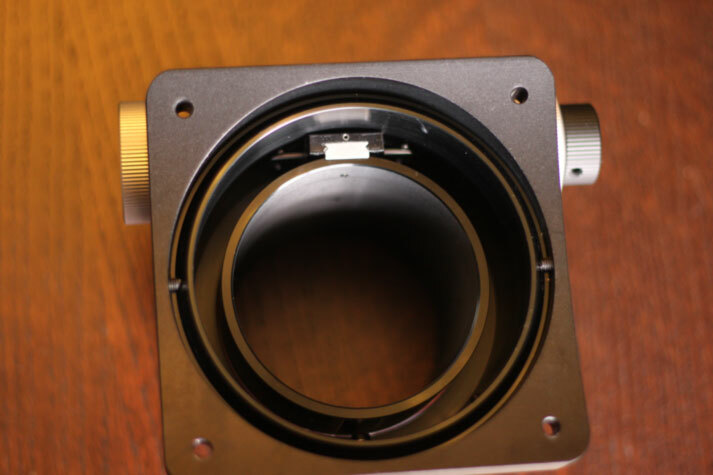 There is a flange on the underside of the focuser that prevents separating the focuser and baseplate. Extreme care should be taken when tightening these grub screws that they are located correctly on the flange. Additionally tightening the grub screws can bend the base out of shape - so don't over tighten. Here is a rear view showing the 2 grub screws and the linear bearing. With the Catseye Infinity XLK installed I could 'rock' the focuser on these two grub screws. I have since replaced these two grub screws with longer ones (they were a bit short). I have also added 2 more grub screws on the opposite side, so now there are 4 screws, one on each side. I have coupled this scope with a 3" Wynne Corrector 0.95x 3 KORRW from ASA. It's the prefect size to fit in the focuser. This annotated image shows the 3 inch coma corrector and SBIG STL Camera in place. The first test image taken with the combination can be seen here. Losmandy style dovetail plate (357mm long) with 4 hex nuts and Allen key. This is way too small for this size scope. Get a DUP 20" from ADM.